This info is primarily for the Samsung Syncmaster 206BW LCD Monitor, although it has been updated with information relating to other similar Samsung Syncmaster monitors (226BW and 223BW). Nearly all Samsung Syncmaster monitors will suffer from 'Bad Caps' similar to those listed on this page. This seems to be due to the fact that for some strange reason Samsung decided to use cheap capacitors in their monitors which are otherwise very well designed and engineered. Some say they used cheap caps so that the monitors would be guarenteed to fail, but its more likely that some office bod said "Oh no Nichicon caps are too expensive, just use cheap ones they work the same"!?! I decided to trace the fault and write this "How to" as I could not find this info anywhere on the net. All the info in this page is copyright to me as I spent time working it out, so do not put this info on other websites without asking me first. Warning: Only attempt this if you are competent to do so! There can be lethal voltages inside the monitor even when its unplugged. I'm not liable if you damage yourself or your monitor trying this repair. Read the disclaimer. If your not sure, pay someone else to do it for you. My info will always be FREE, But if this helps you, please consider a donation to help keep the site going. Important note: this monitor can display very similar symptoms if the signal lead is loose/disconnected or if the graphics card has died in the PC. If possible test the screen on another computer first to confirm that it is actually the monitor at fault. There are three electrolytic capacitors on the power supply board that have probably blown - C261 (1000uf 25v) C263 (1000uf 25v) and C265 (470uf 25v). 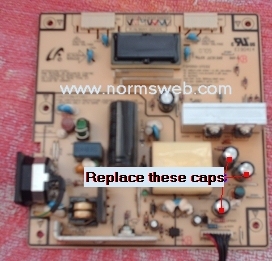 All three caps should be tested/replaced. This should solve the problem. This is a reasonably easy repair if you are handy with a soldering iron, but, some joints are small and there are some very small surface mount components on the board, so be careful with your soldering iron and sucker as not to "shot gun" the board. Note 2: For the 226BW the fix is very similar, the bad capacitors are C110 (820uf 25v), C111 (820uf 25V) and C112 (330uf 25V). 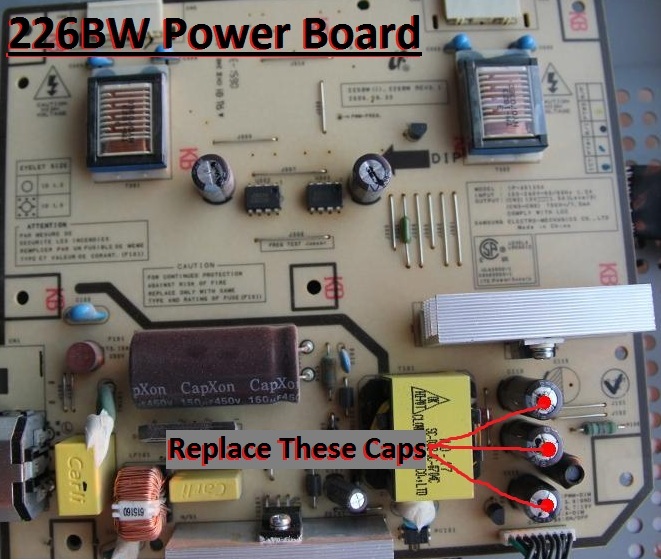 See the picture of the 226BW power board below the 'how to'. -Thanks to Ergo in Estonia for the info and pic. A monitor with this fault will blink a couple of times and then start as normal. You may not even notice at first, but this will get progressively worse with the monitor taking longer and longer to start up. Once the monitor has started up it works as normal until its turned off again and then the whole blinking thing starts again. Eventually the monitor will fail to start up at all, even if left on all day. Lay the monitor face down on a towel (to protect screen) on your bench with the stand hanging off the edge. Pull off the plastic cover that hides all the connections (you probably took this off already when you unplugged the monitor). remove the three screws that hold the stand to the monitor. slide stand out. next, undo the three screws that are along the bottom of the screen. The cover is clipped on all round the edge. Starting at the bottom carefully and gently prize the back off. (if you feel you need to use a screwdriver to help you get it off, be sure to use a wide bladed one as to minimize damage to the plastic). Once the plastic cover is removed, there will be a steel "chassis" inside with a stainless steel cover on the left hand side. this cover just clips in. gently ease the cover off. Next, unplug all the connections you can see. If you do not have a good memory, take a photo of all connections with a digital camera, coz if you plug em back in wrong your gonna fry your monitor. Turn the steel "chassis" over to reveal the power supply and main PCB. Undo the screws holding the power supply board in place, unplug all connections and lift out carefully. Take note: the power supply board can contain lethal voltages even when unplugged. if you are in any doubts get a professional to do it for you. Now locate and replace the three blown caps. The caps are: C261 (1000uf 25v), C263 (1000uf 25v) and C265 (470uf 25v). 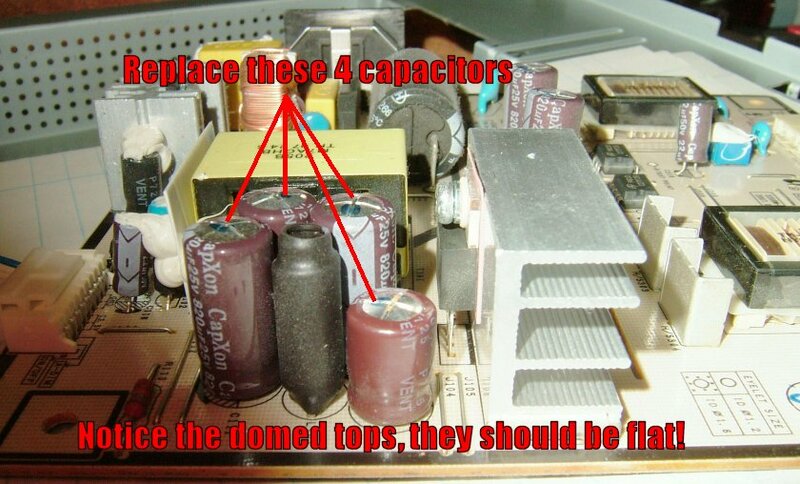 The capacitors can be successfully replaced with 35v ones. 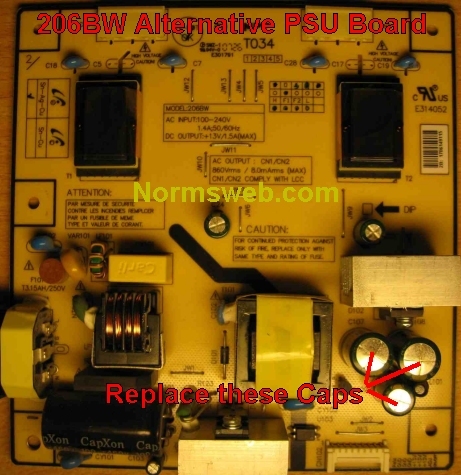 In this case, 35v capacitors wont make the repair any more reliable than the original 25v caps, so you should use 25v if you can get them. Be sure to get low ESR (low impedance) capacitors with a thermal rating at or above 105c. When you replace them, always replace all three together even if one or two test or look ok. It should be noted at this point that although blown caps can usually be seen bulging or leaking, the caps may not show any physical signs but may still be bad. Important note: Be sure to observe the polarity of the capacitors when you take them out. The capacitors have the voltage and capacitance written down one side often along with a marking (see pic below), which always indicates the negative pole. 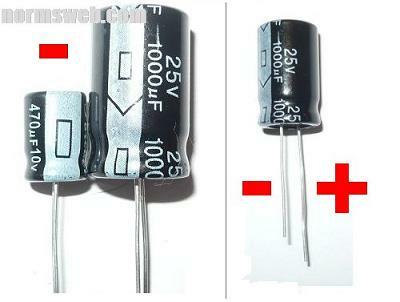 Also, on new capacitors the negative pole is always shorter (see pic). If you put them in incorrectly you will have just made a very expensive homemade smoke machine. That's it...now just put it all back together (just reverse how you took it apart) and your done! The whole job cost less than a fiver and your monitor should now be as good as new. Good Luck! -Norm. Thomas from Denmark writes: A bit of additional info, the original capacitors have 5mm distance between the legs and a diameter of 10mm. The 470 has a height of 15mm and the 1000's have a height of 20mm. The 1000's I used was 25mm in height and still fit but only with a couple of mm to spare, so don't go any higher than that. Anton from The Netherlands writes: I got an addition for your page. I used ultra low ESR (for the 1000uF)capacitors... but those are generally not 10 mm in diameter... but 12.5 mm. This is 'just' half a mm too much to fit correctly.. (i managed to get them in... but they are diagonal now and touch each other at the bottom). 226BW Power Board - Thanks to Ergo from Estonia for the pic. 226BW Alternative Power Board - Thanks to Kees from The Netherlands for the pic. 206BW Alternative Power Board - Thanks to Gatis from Latvia for the pic. Capacitor Polarity Identification - Thanks to Robin in the UK for suggesting my description was unclear. If your screen comes on ok then goes off after about a second, this fix will probably help you. In the Samsung Syncmaster 206BW monitor, the inverter circuit is on the power supply board. Be Warned: the PSU/inverter board can contain lethal voltages even when turned off and unplugged... if your not sure about doing it, pay someone to do it for you. The capacitor C301 is a 470uf 35v, It may not be bulging but should still be replaced (remembering to use a high temperature 105c, low ESR cap to replace it). You may get away with resoldering the transformer (the black rectangle in the pic), however if resoldering it doesn't work it will need to be replaced. The transformer is: 8TC00327 and can be found on ebay. Update: I have recently had emails from a couple of people who did this fix and the fault was still present. The main cause for failure if replacing the transformer and capacitor does not work, is the actual backlight tubes going bad. CCFL backlight tubes are not like normal bulbs. When they start to go bad they will still light up, but will draw more and more current. If the current draw exceeds a certain level then the inverter will shut down to protect itself. The backlight tubes can be replaced in this monitor, but it is not a simple task as the whole screen assembly needs to be taken apart. It is way too easy to either damage the screen or induce dust, so if you wanna attempt it, do so very carefully. Cheap and average CCFL backlight testers will not be able to detect this extra current draw, they will merely either light the tube or not, so if you wanna test the tubes current draw you will need to see a tv repair professional who has a professional CCFL tester. Here is feedback I have recieved from people who have tried these fixes. I found that blowing a hair dryer into the vents at the top of the monitor will let the monitor start up, and as long as you use it, it will continue working. If the day is warm, it will stay on all day. Once the temperature drops below 70 degrees the monitor won't start again, and the hair dryer gets used again. it takes from 30 seconds to two minutes to heat everything up. I just found this page so I'll try the capacitor replacement when I have time. Thank for your help, I have solved my problem with my screen SAMSUNG syncmaster. This was precisely what I needed. It worked beautifully. Thank you so much for sharing the advice re bad caps on this monitor. A supposedly experienced TV repair specialist told me no way could it be faulty capacitors. Just paid less than £5.00 to replace 5 of them, two of which were definitely bad. Followed your excellent tutorial and I now have a fully working monitor again. Thank you again. Best wishes. Spot on. Your suggestion of replacing three capacitors worked like a charm. Dear Norm, I got an addition for your page. I used ultra low ESR (for the 1000uF)capacitors... but those are generally not 10 mm in diameter... but 12.5 mm. This is 'just' half a mm too much to fit correctly.. (i managed to get them in... but they are diagonal now and touch each other at the bottom). I hope this is usefull info. Greetings and thx for the help at fixing my monitor. Hey man, Just writing to thank you for the Samsung monitor bad-cap fix, saved me a lot of dough on a new monitor. Instructions are very clear, much appreciated. I donated, because these kinds of resources should stay around on the web. Hello, i succesfully repaired my 206BW few years ago,caps change (monitor blinked), i was using instructions on your website For that,thank you very much... But now i have new problem.. When i start up monitor,i get picture for 1sec,then lights shut down,but i see pixels with my lamp... So i ordered transformator, replaced it,and capacitor near it... But problem is still here.. :/ Do you maybe know what can be the problem? I cannot thank you enough. I followed your instructions and I`m really pleased with myself for fixing what I thought was scrap. My son and me changed all capacitors we found on the PWRSUPPLY. Samsung 226 works fine again. GOOD JOB - THANKS ! I was given a samsung monitor which seemed to work intermittently when trying to switch it on. I was going to junk it but looked around the net first and came across your website. Read your articles and decided to buy some capacitors at around �10 total cost and follow your instructions. Hey presto the things as good as knew. Just wanted to thank you. Cheers. Thanks for this great tutorial - it saved me having to open up the monitor to identify the broken caps prior to buying them. Now it's working like a brand new one. Keep up the good work, thanks. Hi, I have 2 of these screens and last year I fixed one of them using your guide for screen blinking. Now a few days ago the same screen started up en goes off after a second and stays off. So I replaced the same caps from last year (just in case), and this time I also replaced C301 but not the transformer (couldn't wait for it). But that didn't seem to work. Therefore I decided to replace the one elco that hasn't been replaced (the big one 120uF/450V) and that seem to do the trick. I actually replaced it with a 150uF/450V since the 120uF wasn't in stock and it seems to do just fine for a day now. So this might be a good addition to the "screen goes off" guide to also replace the big cap. Also, thanks for your guides, they're very helpful and easy to understand. My monitor was having trouble getting going and so a quick Google found your site. With clear photos and instructions I was ready to dive in. Having done a few dodgy cap jobs before, I had some spares in my electronics box of the right spec. Both the 1000uF caps were visibly leaking and tested less than 300uF. The 470uF visibly good, but was removed and tested anyway and found to be all good (I have a Peak ESR meter) so I put it back. All fixed and working fine now. Top Man. Thanks for the info on your site. I was able to find all the parts AND a soldering iron for under $20.00. 1 hour of labor + 1 hour of Youtube videos on soldering and the monitor is functioning again! -Thanks! Whoohoo, thanx a super lot for your tutorial on the repair of the 206BW. replaced the 3 caps en we're on again. Saved me 110 euro,- for a new monitor. Thanx a lot. I have just repaired a 5 year old model, obviously a later board with a side connector lower right, the board contains 2 transformers. There are 5 820uf and one 330uf capacitors, all had serious bulges - replaced the lot with Panasonc high spec ones from CPC/Farnell. Now back to normal performance - Thanks. I've managed to get the 1000uF 25V cap from a broken power adapter (they are "ultra low impedance/long lasting" LXZ series), but was unable to find a 470uF 25V replacement. I've found a 50V that is series PL (replaced by PM series, both are ultra low impedance) from Nichicon. My primary question is if a 50V cap is too much over. I got these out of some broken electronics from where I work. Note: I have sent this message a few months ago and didn't receive any response, except for the "mail confirmation". Thank you so much man! I tried nearly everything. Thanks to this article with detailed description of repair. I've opened my monitor and 3 caps were swollen. Now I can still use this after 5 years - I repaired my monitor for nearly zero cost. Thanks again. I bought the 3 condensators for 0,98c and went to the university to the laboratory to sold them. Came home, build the monitor again (with pictures as you suggested) and as I turned it on, it worked! no blinking any more! Thank you very much! And about the numbers of the condensators, they weren't the same, but having the old ones, I could tell the guy in the electronic store what I wanted to buy I even showed them to him. Thanks again! Well I just saved 150 euro thanks to you! I had the blinking problem and it was getting worse. I stumbled upon your tutorial, bought 5 euro worth of capacitors and fixed it! Thank you so much ! Thank you very much! your tektips on how to repair the samsung syncmaster 206BW helped me and it work GREAT!! thank you so much! Thanks much, one more old Samsung saved from the landfill. $5 to Radio Shack for parts and $5 to you! BTW, a question, the Shack only had 35V electrolytics, not 25V - I presume that won't cause any issues and might prevent a reoccurrence of the problem? Thanks! I referenced your article to troubleshoot my monitor and it was bang on. I appreciate you taking the time to post and help with such detail. Unfortunately due to one of my computers going down, a few comments may have been lost before I had chance to upload them to the web-page. If your comment doesn't appear here, then it may be one of the lost ones and I can only appologise. My 206bw kept blinking for about an hour before actually turning on. So I decided to Google this and came to your detailed guide on how to fix it. I went out, bought the condensators and managed to fix it! Now it's working perfectly again, all thanks to you :D. I made a small donation, hope it helps. Thanks again. Whoohoo, got my 206BW to work again, thanks. A bit of additional info, the original capacitors have 5mm distance between the legs and a diameter of 10mm. The 470 has a height of 15mm and the 1000's have a height of 20mm. The 1000's I used was 25mm in height and still fit but only with a couple of mm to spare, so don't go any higher than that. Thanks, I follow your tips for my monitor Samsung that blinked on and off. Changing the three capacitor and now it is perfect!! Norm,your article inspired me to pick up an iron for the first time.The results were not pretty but my monitor is now good as new. :)Thanks a bunch. Excellent fix instructions - replacement parts were �1.49 from Maplin :) You mention in the instructions that the capacitors have writing on the side of the negative pole. The ones I got had - - - down the side of the negative pole and writing close to the positive pole. Thanks a lot for the tutorial on fixing my Syncmaster, it works as new now! Found your site after searching for my blinking issue. First time I have attempted a fix like this and after watching a few "how to replace capacitor videos" I followed you instuctions and I am now a happy owning of a fixed Syncmaster 206BW saving me lots to replace this monitor. Thank you very much. Replaced the 3 caps according to your guide and it worked like a charm. Bought long life caps to replace with. Thanks!! Norm you are the dogs bollox mate..!!! when i read through you fix page i thought, holy crap i cant do anything like that, but i sat for a while and thought well the screens knackered anyway so why not give it a go... so i did and followed your instructions to the letter.. The three capacitors i replaced cost me a total of £1.48 from maplins and it took around an hour of my time, and boy was it time well spent..My samsung is now working again and its all thanks to you and your tutorial. Thank you thank you thank you .!!! Thank you, for the tutorial about fixing my Samsung. It all went well and monitor is working. However I have question, in the shop where I buy the capacitors they were smaller in size. Does that mean that they will have shorter life than the previous? I used your description to replace the 3 capacitors (2 were visibly blown) and it worked just great, thanks for saving me a lot of money! I had the problem where the monitor would cycle on and off. I replaced all 4 capacitors mentioned (although only the two 1000uf 25v ones had visible damage) and now I'm typing this message on a working monitor. You saved me a fair amount of money, and honestly its been kind of a thrill to fix something rather than just throwing it away and replacing it. Many thanks, cheers for hosting this webpage and I hope you have a good Christmas. You're a legend Norm. My Samsung was experiencing the "screen blinking" problem and I was minutes away from buying another, in fact I was in the process of googling the specs when I stumbled across your page describing my exact problem. Bought some caps instead and installed them last night, monitor is now as good as new! BTW I found it was much easier removing the solder on the joints if I applied a little regular solder first, caused the whole thing to melt instantly even with a fine tip. Small donation sent, thanks again! Thanks for the fix! Had to replace all 3 swelled capacitors. I went ahead and replaced the other 470uf since I bought an extra one anyways. Just wanted to let you know I bought this monitor in Eastern Canada and the capacitors are: C261 (1000uf 25v), C263 (1000uf 25v) and C265 (470uf 25v). Maybe in just rare cases they're different, like in Mikes case. Thanks again! You saved my Samsung SyncMaster 206BW! 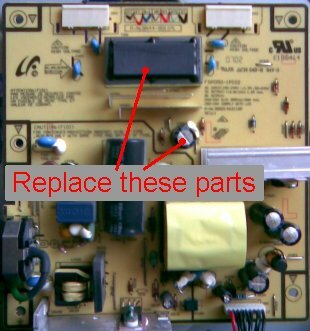 Thank you very much for your tutorial on how to fix the Samsung SyncMaster 206BW monitor! I sent you a well deserved donation. I used PANASONIC - EEUFR1E102L for the 1000uF capacitors and PANASONIC - EEUFR1E471 for the 470uF capacitor, ordered through Farnell (next day delivery) Everything worked like a charm, and now the thing works better than ever ! Thanks again, and keep up the good work! Norm - you're a man amongst boys! Thanks so much for these great instructions. I'm so glad to have extended the life of this monitor. I've sent you a well deserved donation and would encourage others who found this information useful to do the same. Ebay is a great source for buying low quantities of capacitors. Ask them which brands they are and try to get a trusted brand like Panasonic. Also ask the seller what the diameter. The existing ones are about 10mm. The ones I bought were a little too wide but I managed to fit them. Thanks again Norm. Hi Norm, I just made a small donation to you out of thanks for your Samsung fix. I couldn't afford to get a new monitor at the moment, so your fix was a lifesaver. I have never done this kind of cap replacement before, so I was pretty happy after doing it and seeing my monitor working - not blowing up! :-) Thanks again! Norm, I want to thank you for making that information known and available. After reading and downloading your photo and other information, I disassembled my monitor to make sure I could, and checked the capacitors. One had evidence of a leak at the top, but the others were not bulged. I took photos as you recommended. I replaced the capacitors and the monitor now works fine. The only concern I had was making sure I got the +/- right and I assumed the silver stripe was - (negative). The board identifies the + side. Guess I got it right because it works fine. Dear Norm, i just did the fix and its working 100% again now! Big up and thanks a lot. Thank you for your clear and extensive instructions, we succeeded indeed in repairing a defective Samsung SyncMaster 206BW following your instructions and it works, the monitor is alright again now for only EUR 2,05 for the parts and an hour of work ! Hi Norm, I just wanted to take a second to thank you for your detailed and informative post on how to fix the Syncmaster power issues. My friend had this monitor and it started having the issue where it would turn off and on rapidly if you hit the power button. He bought a new monitor and gave his Syncmaster to me for free to try and fix. After finding your tutorial, it took all of 20 minutes to replace the capacitors and now the monitor works like brand new! Thank you so much! Just a quick note to say thanx. I never usually bother to add feedback after I find the information im looking for on the net. I fixed my monitor using the info I found from your site. these were taller than the original caps, so I added a thin sheet of insulation material between the case and the top of the caps to be on the safe side. I replaced all 3 caps, didn’t even bother to check them, they looked slightly “bulgy” So once again, many thanx for your information of this. Good website. Hey man, Ive had 3 206BW samsung monitors for about 3 years now, and 2 of them stopped working one after another over the last 6 months.. So instead of throwing them away, I searched for an answer on google and found your site..
On one 206BW screen only the 2x 1000uF 25V caps had bulged, on the other one the same caps + the 470uF had bulged.. none of them were blown.. Worked wonders! Keep up the good work, and thanks alot! Thanks Norm. I ordered capacitors from Mouser.com (647-UBT1E102MHD for 1000uF and 75-678D477M025DM3D for the 470uF and just in case, I ordered 667-EEU-FR1E681 for the 680uF). Mine had the 470uF version. Total cost, $9 shipped. I'm not the best at soldering, but replaced them and she fired right back up. I took some various photos if you need any that you missed in the writeup. Thanks for your writeup! Hi! Found a samsung bw206 in the trash at my apartment house. Pick it up to my apartment and turned it on. It just turned on and off. Went online, found your fix. Did the magic and now it works!! Never soldered in my life before. Thanks so much! Wished I had a job and money in that case I would have sent you some, but I send good karma instead! Thank you for the fantastic guide. I bought the capacitors from eBay for 2 quid and am now typing this message on my repaired Samsung 206BW! (All three capacitors on my monitor were bulging slightly at the top). Cheers! I've come up with a temporary solution i guess that is when your monitor is blinking on/off, you press the MagicBright "half-circle" of presets and it starts normaly. You have to wait about 10 secs and then you can change to your original preset. I don't know if this works only for me as my caps aren't fully broken or it works anyways. I hope this helps. Norm, The hardest part was prying open the case. Instead of a screwdriver I used a paint scraper. It gives pretty good leverage, but you have to make sure that you bear down hard enough or the blade will pop out of the groove, possibly scratching the case. If a scrap of heavy paper (an index card is good) is folded and placed over the scraper blade, there will be a snugger fit, and if the blade does pop out, the paper might prevent scratching. Thank you!! My monitor works again!! My Samsung SyncMaster 206BW LCD Monitor would turn on for 1 second... and then turn off again. I purchased the three capacitors and followed the instructions on your website. I must admit that while I was working on the power board I was seriously doubting that this would even fix my monitor. But I completed the process and put everything back together. I turned my monitor back on and it did the same thing as it did before... it came on for 1 second and turned back off. So I tried turning it on again. This time it came on and STAYED ON!!! It has been working perfectly ever since! Thank you very much for your "how to" website! You saved me from having to buy a new monitor... and I actually had a lot of fun working on it!! Hi! About an hour ago I returned from dinner, and found a Samsung Syncmaster 206BW with a flashing blue power LED. Disconnecting the data cable did not show the "no signal" message. Until today it had always worked fine. Powered up my laptop, and quickly found that it's a common problem with this monitor, including a youtube-video linking to your website. The two bulging 1000 uF caps where hard to miss, but thanks to your instructions, I knew that it should be easy to fix even before I started opening the case, making the whole process much more fun. I found a donor project with some low-mileage 1000 uF/25V low-ESR capacitors. (mine also had the 680 uF instead of 470 uF, which still looked fine). Prying open the plastic back took the most time, so I checked it was working before snapping it on. Plugged the monitor into the (still running) desktop, and everything is working fine now. Thank you very much! Norm - Thanks so much for the comprehensive instructions on this. As I pulled each of those 3 caps from the PSB, I did a simple resistance check. ALL THREE tested OK in this mode! And NONE of them exhibited any of the typical visual symptoms of failure, either. But of course I had the monitor opened up, so I replaced the caps with new ones, and the monitor worked 100%. Sent U a small donation with much appreciation. First of all I want to thank you for your tutorial on how to fix the 206BW. I had no previous experience on how to de/soldering a capacitor, but with the help of your instructions and an E-how (soldering) video I repaired it. I only replaced the two 1000uf capacitors, both were bulging, the 470uf cap was still intact. The two 1000uf caps I bought were larger (which I didn't know till I placed them) than the original ones and it was a really tight fit. The monitor stopped working after one a half week since I first noticed the symptoms. It went exactly how you described it. First it took 2mins to boot and the last time it still worked 1,5 hour. Again a sincere thank You. I would like to thank you for the detailed information that made me fix my 206BW monitor! You are truely awesome. I have access to a few bad 206 monitors. I just fixed my first one. Thanks for the info. I followed your guide. Ordered the parts online. Soldered my first two capacitors ever. I didn't know what I was going to do. Thank you very much. Norm, thanks for this great guide, you helped me save my monitor! Hi, I had the same problem that other people with this monitor, thanks to your help I get the way to solve it replacing the capacitors C261 and C263, the only two damaged. My son found your website when searching for a fix for his screen, he was about to order a new screen! Many Thanks for the repair instructions for our faulty screen. I sourced the 3(high temperature)capacitors at our local Maplins for £1.10 inc VAT earlier today. An hour or so carefully following your instructions including taking photos of the critical stages and it fixed the fault. (I am an ex-computer engineer and was familiar with component change fixes, but have not tackled high tech stuff like this.....) Thanks again. I would like to thank you for your recipe for Samsung Syncmaster 206BW blinking on start up. I managed to fix my monitor in 30 minutes and it costs me 3 euro only. Thanks a lot! Samsung Syncmaster 206BW LCD Monitor fix worked for me. i bought it at a yard sale for $4.00(US) and $10.90 parts, (my solder wick was old/didn't take the time to look for it), the caps were $5.00 at Radio Shack and about ½hr time. thanks, very precise instructions. i'll renew my pay pal and chip in a bit. thanks. I just wanted to say thank you soooooo much for your post on the 206bw flash start problem. It was an easy fix with the info you provided. Bought the parts from my local Radio Shack and had it running in 20 min. Again thanks a bunch!!!!!!! Thank you very much for the tutorial, you saved my monitor :) Best regards from Romania! Hi Norm. Just wanted to say thanks for the guide. I have a 206bw that was 4 months out of warranty. I replaced all 3 caps, plus 301, since I had the cap laying around at my fathers house. Works great now. Thanks again! Thanks for the 206bw fix. Two of the caps were swollen.